Composed in Middle Babylonia around 1200 BCE, The Epic of Gilgamesh foreshadowed later stories that would become as fundamental as any in human history: The Odyssey and the Bible. But in 600 BCE, the clay tablets that bore the story were lost to the world, buried beneath ashes and ruins. David Damrosch begins with the rediscovery of the epic in 1872 and from there goes backward in time, all the way to Gilgamesh himself. The Buried Book is an illuminating tale of history as it was written, stolen, lost, and—after 2,000 years and countless battles, conspiracies, and revelations—finally found. 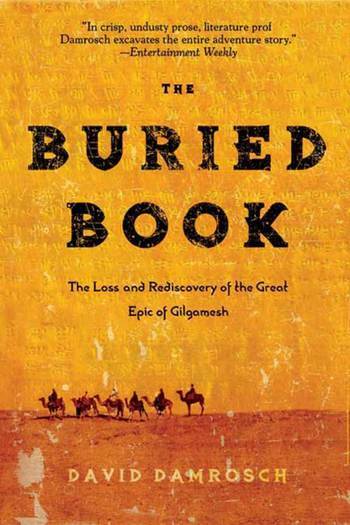 “David Damrosch's The Buried Book is a remarkably original, narrative analysis of the loss, rediscovery, and literary-spiritual values of the ancient epic, Gilgamesh. There is somber wisdom and wit in Damrosch's comprehensive story, which finds room for Philip Roth's The Great American Novel and the murderous fictions of Saddam Hussein. It is salutary to be reminded by Damrosch that ultimately we and Islam share a common literary culture that commenced with Gilgamesh.” —Harold Bloom, author of Where Shall Wisdom Be Found? David Damrosch is a professor of English and comparative literature at Columbia University. He is the general editor of The Longman Anthology of World Literature and the founding general editor of The Longman Anthology of British Literature. He lives in New York City.